After long time, I am back with another awesome android trick . Android phone is having lots of abilities and most important is you can add more features or your own built one. Rooting android phone increases its features beyond the limit. There are many after rooting tricks available for almost any android device. People are often interested in hacking or spying tricks and android is not an exceptional platform for them. Such an amazing trick XDA-Developers Member RavinduSha has come up using his app. He built an app which can be used to turn off your android device remotely. You can play games with your friends , make them fool, and have lot of fun!! There are many benefits of this app though it is beta type app , may not be fully functional. If you got struck in some unusual situation where you cannot get your phone then you can easily switch off your device using this app. Playing pranks with friends is the most lucrative use of this app. Thus this app seems to be very useful one and can be proved boon in many situation. 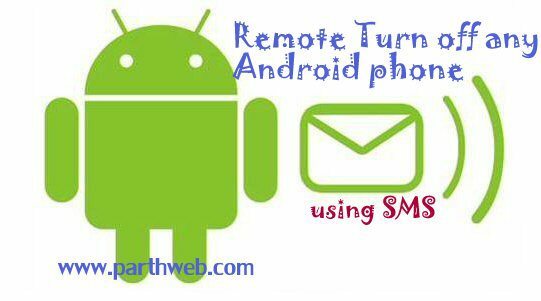 Now lets talk about the process to install and use remote turn off app to switch off android phone remotely. Requirement: You need a rooted device to use this app. If you face any difficulty while rooting , contact us or comment below, we will help immediately. Also , detailed complete guide on rooting android device is coming soon. Now Download Remote Turn Off app zip file in your computer and extract it. You will find the apk file in the folder > System>App> Remoteturnoff.apk. Transfer it in your mobile using USB cable and install it by opening in your mobile. If you have SuperSU installed in your device after rooting, it will ask for app permissions. Give all permissions to Remote Turn Off app to let it work efficiently. Now Launch and open the app. You will see the interface asking security code. Default code is null so change it to any password or digits. Make sure that it is case sensitive. Now using other mobile , send the security code in sms to your mobile. This app will read sms and as soon as it matches with your saved security code, it will turn off or switch off android phone. Thus your task will be accomplished remotely without touching mobile, without being near to your android device and also without the use of internet. You successfully configured your device for remote turn off. You can easily install this app in your friend’s rooted device and surprise them. Share your experience and views. We are interested about your experience with your friends with this prank. Do comment and also share this article in facebook. How To root Gionee P2?? I need to root Micromax Canvas Knight. Any help available for that? You need to root your device correctly maybe you have newer os. Send us details about your device Nd we will try to find working method to root. Parth can you contact me on this I am looking at a commercial use for this feature.. I accidently deleted all internal memory apps nd data , phones get switch off. Now when i turned it on it flash a logo micromax android and switch off…it accurs repeatedly. My recoverymode didnot wrks please help me if u can..
“null” is “current code” of this app..
How to root ASUS Zenfone Max? my phone is already rooted..but problem is,what is the current code..